Includes special red and black "Release the Kraken" knob! Blue milk crate not included. Currently listed by a private eBay seller, this project Strat is mostly Fender American content except for the custom ordered cedar body. The neck is "V" with jumbo frets and a big block trem. The cedar body is finished in a light lacquer, and should age nicely. 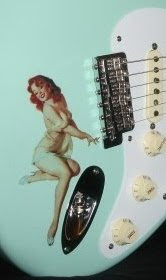 Listing says, "...this guitar is a picker's dream and tone to the bone." All the more reason for wanting to sell it of course. Such holy grails as this tend to clutter up the place. But maybe it does sound good. Perhaps all those knots form highly resonant tantric meridians of tone chakras which tap into the univeral center of Stratoliciousness. At the very least it makes for a fine rustic, Western utility that could be converted into a pizza paddle for some Sunset Magazine gadgets feature. And maybe it'll cure your asthma too and keep the moths from eating your Sears poncho. Now who you jivin'? Most important is that something about a natural cedar Strat conjures my imagination.